← Death Salon LA… and beyond! 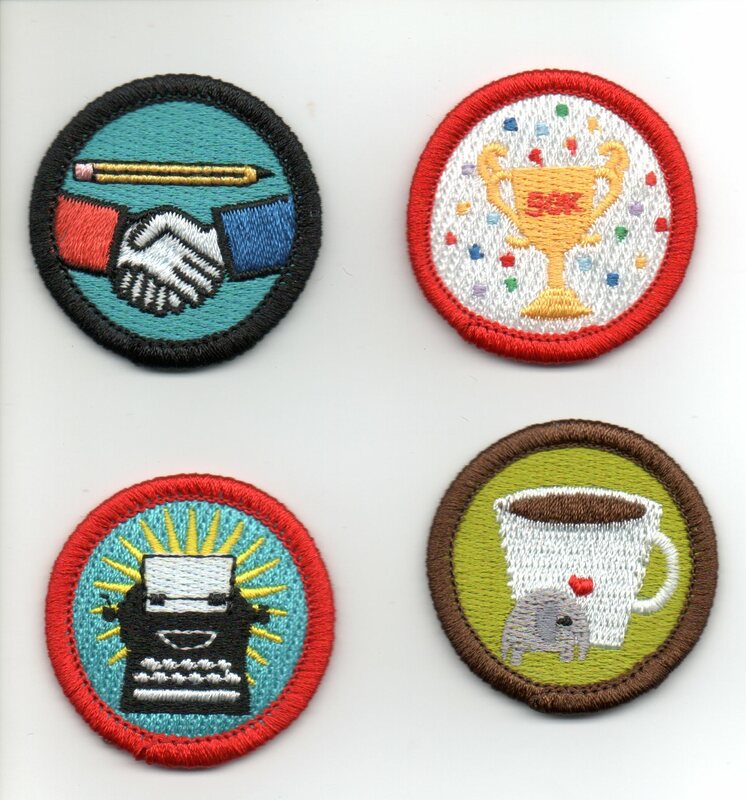 Nanowrimo Merit Badges, the best donor gift ever! This is yet another NaNoWriMo. I try to participate every year, but I generally cheat spectacularly in order to make my word count. Does that make you think less of me? See, I decided early on that since I know I can write a novel, writing a novel isn’t the most useful challenge for me. Getting 50,000 useful words pulled together in a month: that’s a challenge worth pursuing. The key there is useful. I’m not going to pad my word counts out with shopping lists. I’m not going to use multiple versions of a scene that I write over and over as I try to get it right. I’m not going to include character worksheets or outlines. All I’m going to have at the end of the month is 50,000 words of earnest, usable first draft. Last year was the first time in 10 attempts that I wrote the first draft a new novel from start to finish. I was reasonably confident I could do it because a) the book was a sequel b) it drew heavily on short stories that I’d already written and c) I had a killer first scene in mind. It was more than usually satisfying to “win” Nanowrimo last year, since I was using it for the purpose for which it was intended. This year, though, I’m back to my old pattern. I’m using the Novel Writing Month to write the first draft of a nonfiction book I’ve wanted to write since 2001: my book about the Pioneer Cemeteries of the San Francisco Bay Area. I’ve researched most of the cemeteries. I’ve visited many — though not yet all — of them. The book has been waiting for me to clear the decks, settle down, and get to work. Thirteen days in, I’ve got about 22,000 words. That’s 24 cemeteries described so far. I think the book is going to include 50. That’s not all the cemeteries in the area by any means, but it’s enough to make a good strong book. All that doesn’t really matter. Nanowrimo is not about finishing, for me. It’s about having something to show for the month, something that didn’t exist before. In this case, it’s something that I’ve wanted to see for a very, very long time. As far as I’m concerned, that’s the best thing about being a writer: being able to read the books that exist nowhere else but in my head. I’m really excited to read this one, once it’s finished. This entry was posted in Nanowrimo, writing and tagged Bay Area Cemeteries, nanowrimo 2013. Bookmark the permalink. Good luck, Loren! I am sure you can do it!